Autumn has become a time for reminiscence. Two of my older art works that have captured profound biographical moments are in exhibitions on the East and West Coasts. 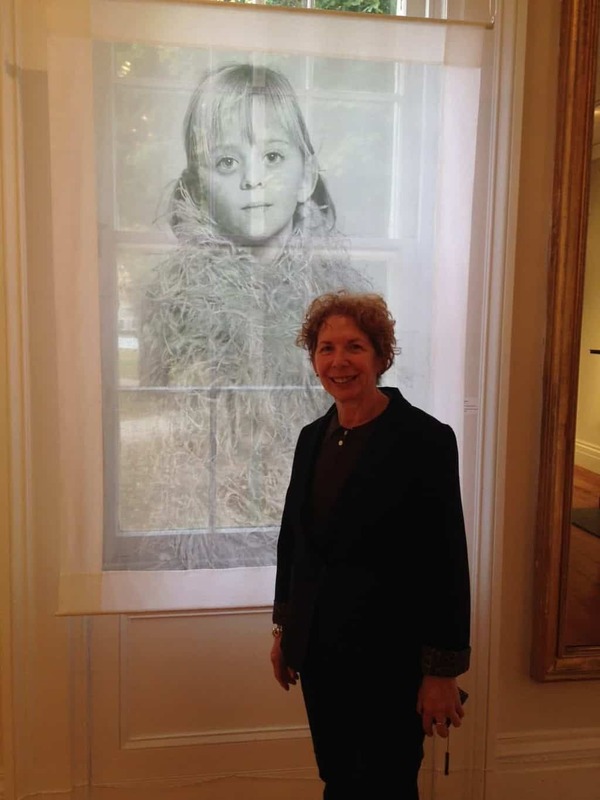 ‘CHILDHOOD MEMORIES’ opened on October 19 at the historic Mills Pond House Gallery in St James, New York. 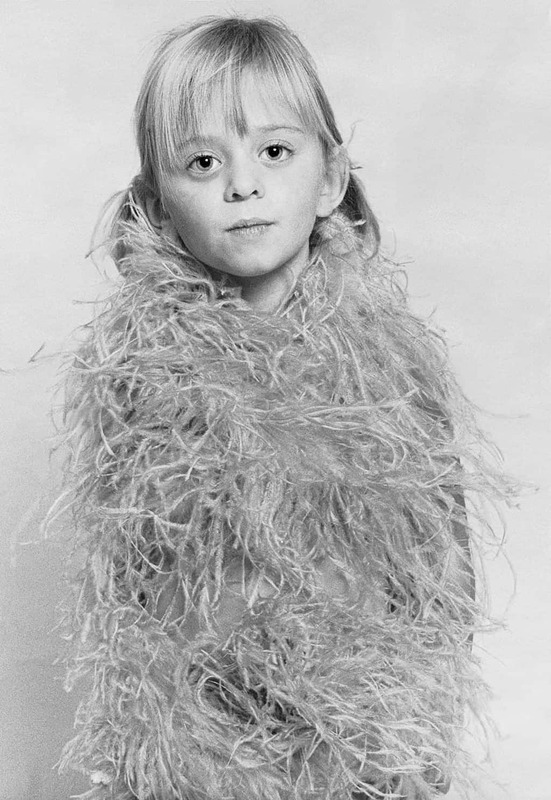 ‘Thoughtful Eyes, Fanciful Dreams’ is based on a 1979 iconic photograph of my niece, Jaimie, when she was six-years-old and staying overnight at my NYC studio. Jaimie, her sister Lani and their brother Scott, spent many weekends with me in my downtown loft as they were growing up. ‘Thoughtful Eyes, Fanciful Dreams’ records a moment, measured not as an isolated fragment of time, but suggesting the narrative arc of childhood/ capturing past, recording present and projecting into the future. Jaimie, cocoon-wrapped in a feathered cape, appears like a chrysalis emerging in the moment of becoming. Her wide-eye gaze draws the viewer into the enigma of childhood dreams. The presentation of the printed image on cotton voile adds to the fluidity of the work. 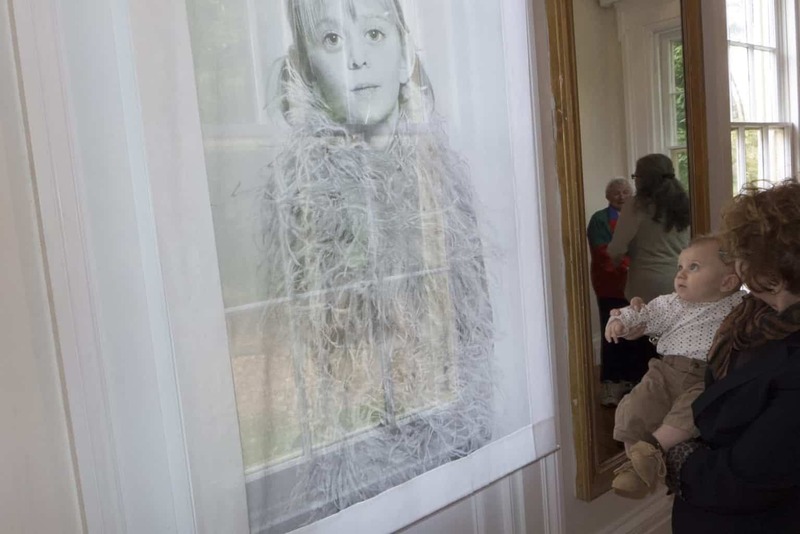 It can appear as a tangible portrait of a young girl, or depending on where one is standing in relationship to the piece, the image can become intangible, and disappear into the back light. ‘Thoughtful Eyes, Fanciful Dreams’ reflects not just the fleetingness of memory, but the evanescence of childhood itself. My brother, Al and his children, Sean and Amanda came to the reception. The Rosen Clan also included my brother, Michael, his wife Roberta and my nephew Scott with his wife, Laura, and their baby Nico, attending his first art exhibition. My second art work, ‘Syd and Jacki at Summer Camp’ was included in the exhibition, ‘EARLY WORKS’ at the RayKo Photo Center in San Francisco, California that opened on October 17th. The entire gallery of early photos can be viewed online . 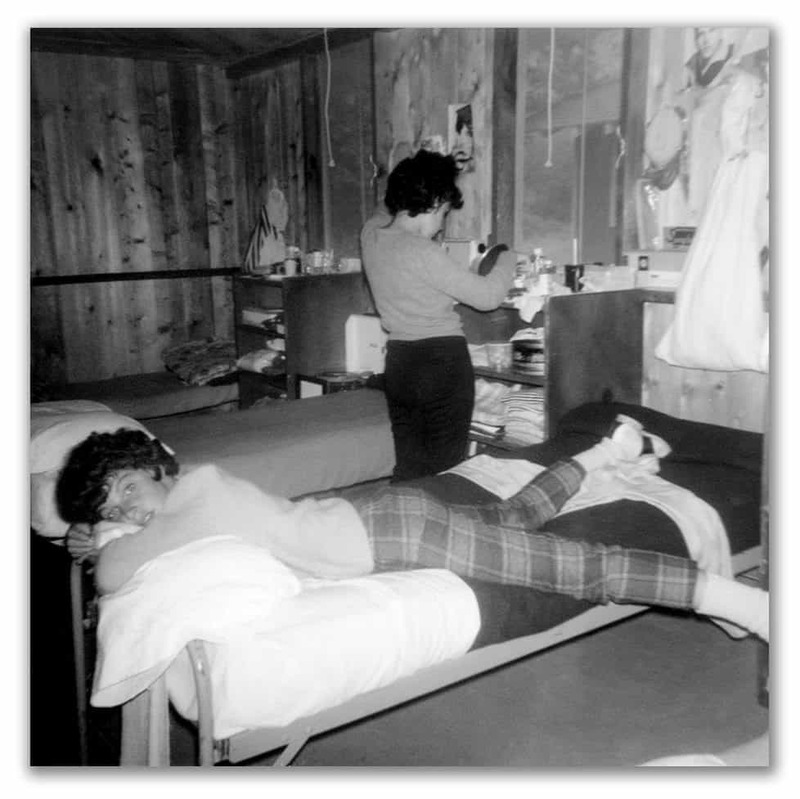 This photograph dates back to 1961 when I was 14-years old at Cejwin, a summer camp in Port Jervis, New York. ‘EARLY WORKS’ is an exhibition that examines the naive imagery made by contemporary photographers when they were children. In the photo ‘Syd and Jacki,’ I can see how aware I was of Syd’s gesture in her body language as she is lying down and looking at me, and how I also captured Jacki in the background obliviously looking into a mirror and doing her hair. This picture depicts a naïve eroticism and reveals what was both hidden and suggestive in our first bloom of teenage sexuality. I also remember how much I didn’t understand about myself and what I was feeling, other than I seemed different than the other girls in my interests and desires. This picture reminds me how scary it was to not have the support of family and friends, or the vocabulary to be able to speak the words that became one of the defining elements of my life, my fine-art photography and my future career as a socially concerned photo-journalist. On the night ‘EARLY WORKS’ opened, I decided to try to locate the girls in this cherished photograph. Thanks to FB, I found Syd within 30 minutes and we were soon excitedly chatting and recollecting our adventures as old friends do. In the next week, Sydell located Jacki and the rest of our 1961 summer bunkmates. We are planning a reunion in NYC. So, find some of your own old photographic images and perhaps rediscover what they mean to you now! Your exhibition comments, EARLY WORKS, Syd and Jacki at Summer Camp, motivated me to pull out old photos and contact a few childhood friends…Your photo commentaries and insights are as eloquent as your photos are beautiful, evocative and expressive. Thank you again for sharing your talents!!! Gorgeous writing — not to mention photos! Fun to see all you’re up to! Amazing the power of an old photo!